Published May 18, 2016 | By IGotIt! 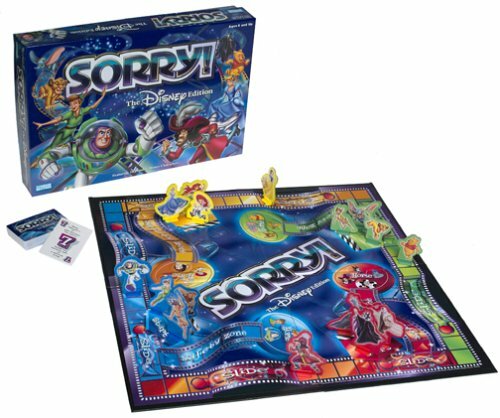 These enjoyable Disney board games offer kids a great way to learn through play and develop valuable social and developmental skills. What’s more fun is when they can play with their favorite Disney characters. Family time is especially important for kids to learn emotional intelligence and confidence that will significantly increase their success later in life. Playing board games as a family is a great way to naturally develop these skills. 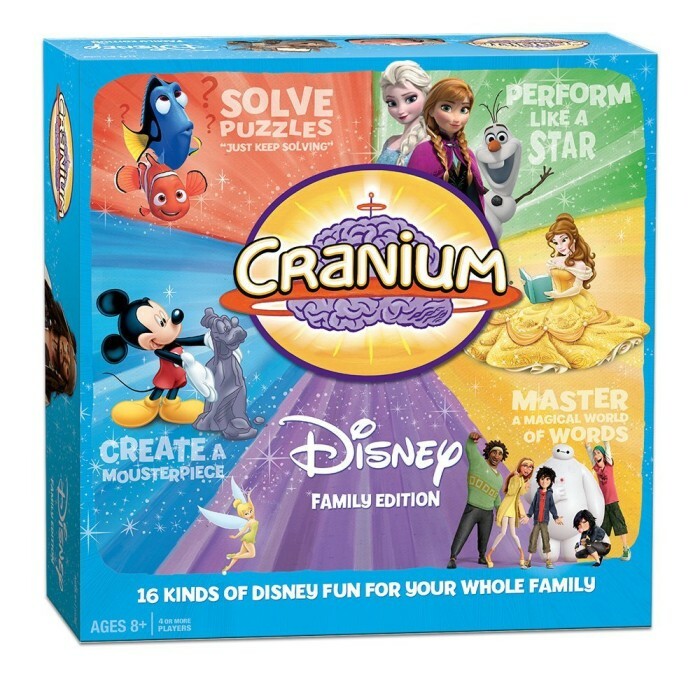 Cranium with custom Disney game board and 400 cards is super fun for the whole family. Kids and grown-ups can laugh along as they test their knowledge through drawing, sculpting and acting out of favorite Disney characters. 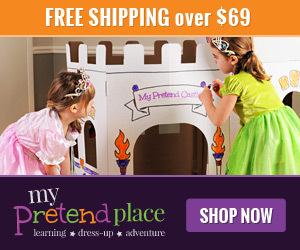 Features classic Disney characters and new favorites such as Frozen and Big Hero Six. Great for kids ages 8 and up! 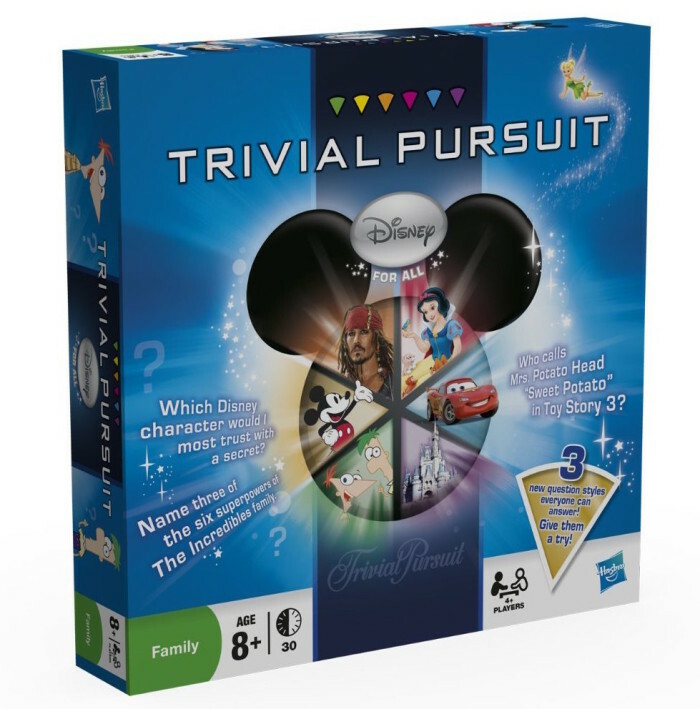 Trivial Pursuit has been a classic game of fun and knowledge for over 30 years and with Disney’s version you can have even more fun learning Disney facts. Choose from List questions, Take 2 Trivia or My Disney, where you get to find out how well your teammates know you. 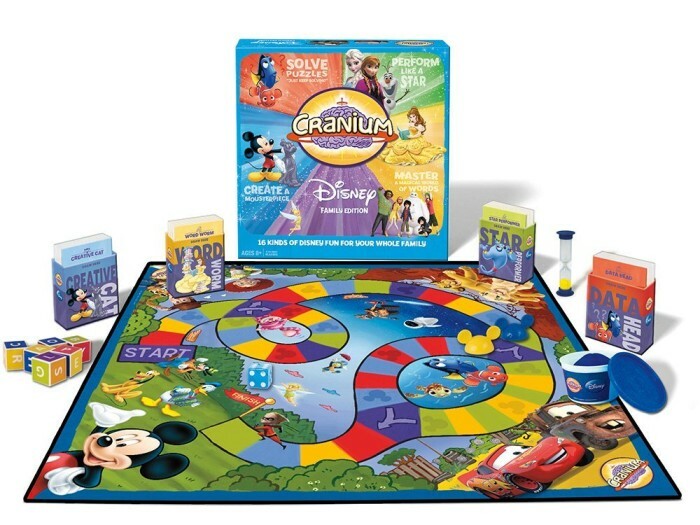 This Disney board game is more than just trivia, there are also many personal questions where you can learn more about your family and friends, such as asking what your favorite Disney moments or characters have been. 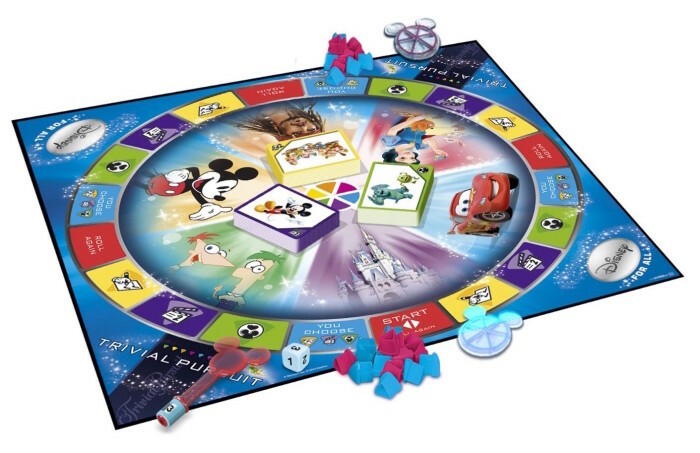 Trivial Pursuit Ultimate Disney Edition is a great way for family members to work together as a team and compete to win at the same time, while learning about each other. Ages 8 and up, minimum of 4 players. Perfect for family game night! 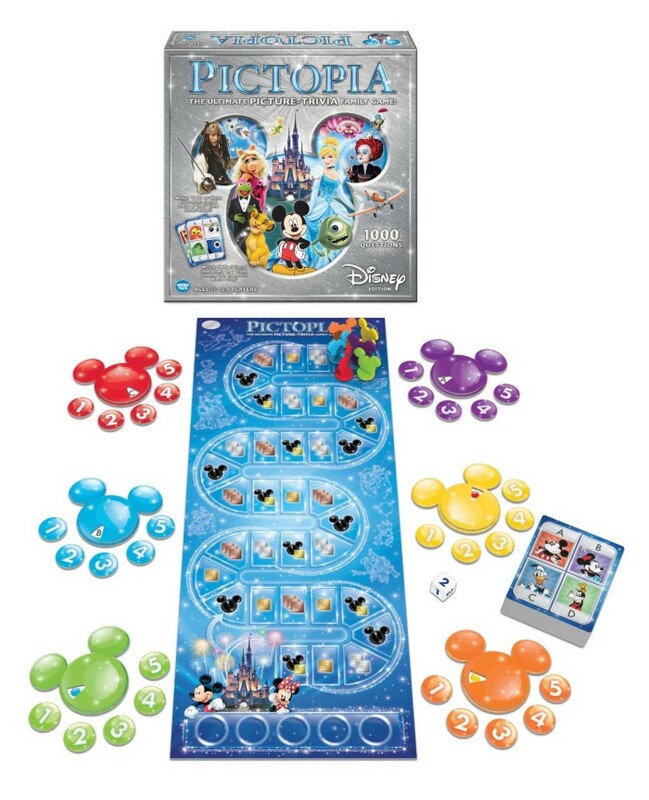 This collectible Disney board game of trivia is perfect for the whole family and includes two separate decks of cards, one for kids and one for adults. The card deck for grown-ups includes 1,600 questions and the kids’ deck has 800 questions. Includes beautiful metal film-reel tin with Disney throughout the years. 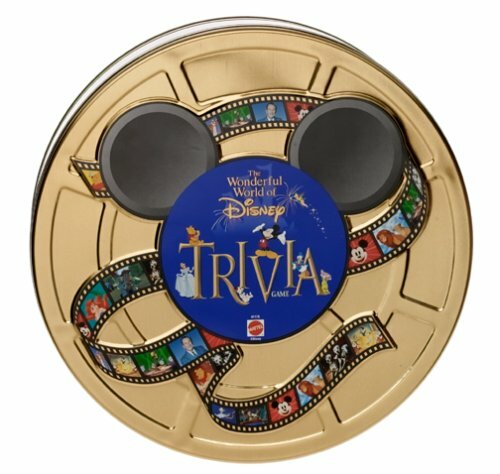 In The Wonderful World of Disney Trivia Game players gain tokens for correctly answering questions about Disney movies, characters, theme parks, music, and even movies from Touchstone Pictures, moving them along the board from start to finish. For kids and adults ages 7 and up. Play as individuals or set up teams. And, when you’ve mastered all the questions in this game, you can also purchase additional trivia games to continue play. Super fun for the whole family of Disney fans! 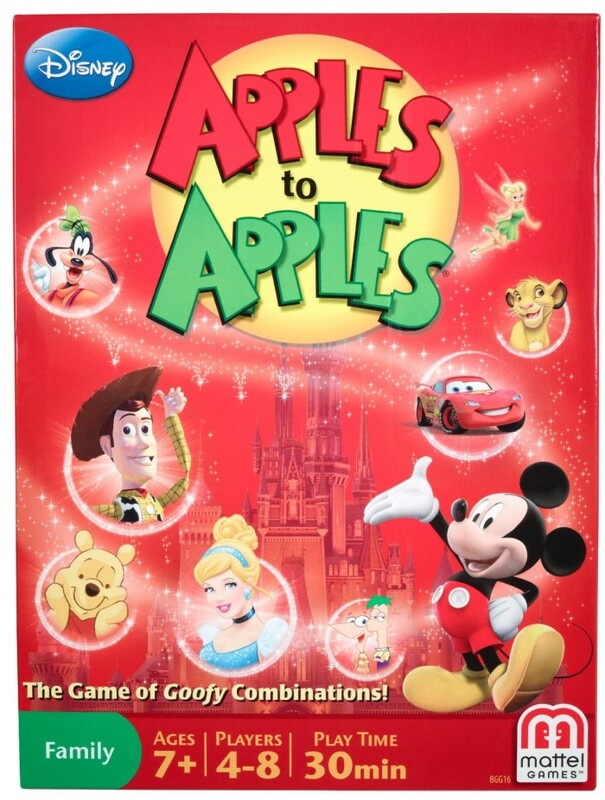 Have lots of fun goofing around with this fun Disney version of Apples to Apples! Includes new twists on the original game that make it even more fun. Red Apple cards come to life with everything Disney from theme parks to movies and TV. Includes 360 cards and the Disney exclusive Poison Apple card that offers a major twist in play. 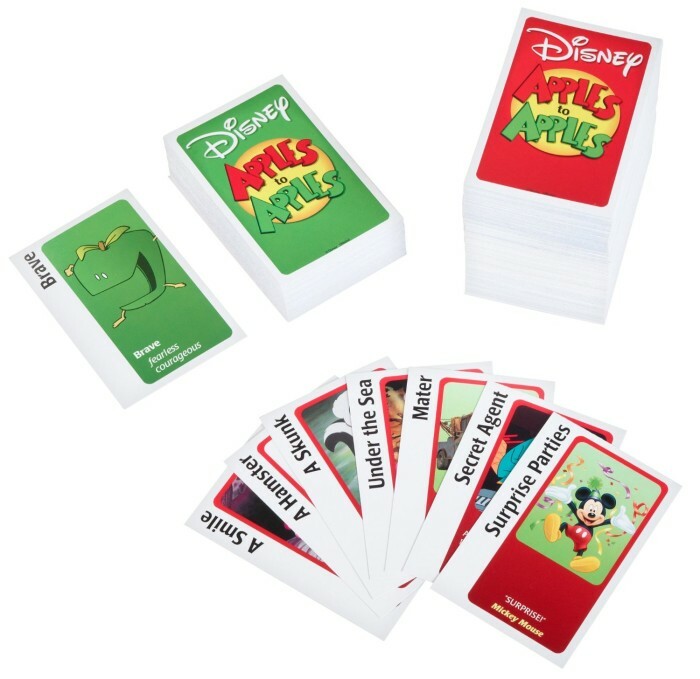 Lots of family fun with the Apples to Apples Disney Card Game, for ages 7 and up with 4-8 players recommended. 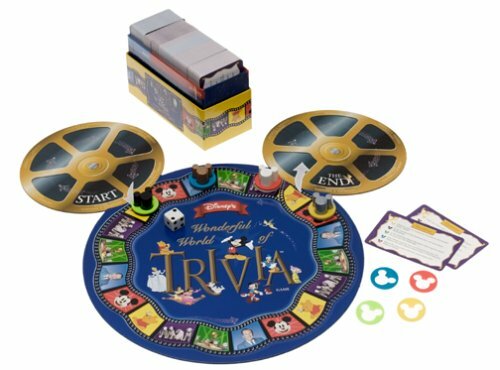 The ultimate Picture Trivia family game includes trivia from cartoon classics, hit movies, TV shows, and theme parks. Players test their knowledge of many well-known Disney characters through teamwork and competition. You’ll also have fun learning about other players with guess-my-answer questions. Players get to take turns playing the host and getting to ask the questions while players answer questions individually or through teamwork based on the Disney pictures included on the cards. 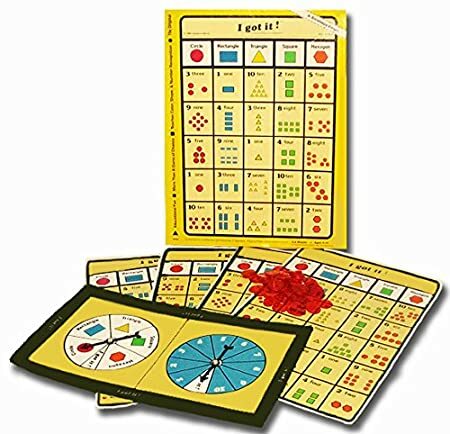 Family and friends will have lots of fun with this strategic game that encourages both cooperative play and competition. Ages 7 and up recommended. Take the Classic game of Pictionary and add a Disney twist and you have a game that is super “Goofy” fun for the whole family. Players use charades, singing, drawing, and sound effects to give clues and get their team to draw the right card first with Mickey hands. 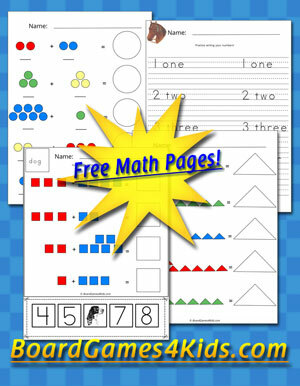 Clues are easy enough for kids and fun enough for adults! 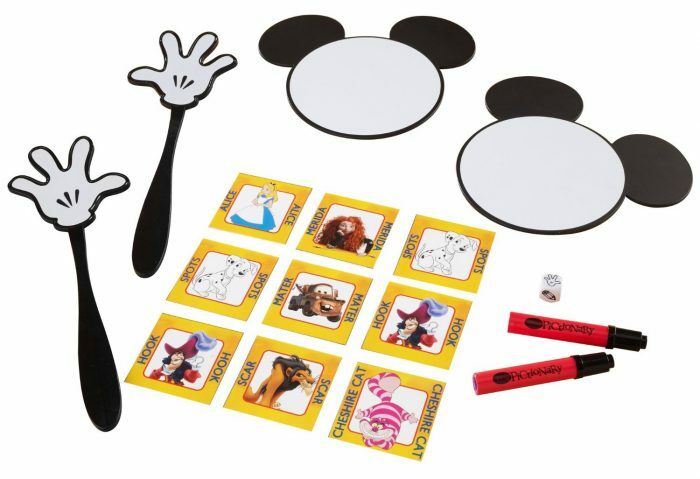 The Disney version of Pictionary includes 200 cards with 400 clues, an “all play” game mode, adorable Mickey slap hands, Mickey dry erase drawing boards, and of course, all of your favorite Disney characters. 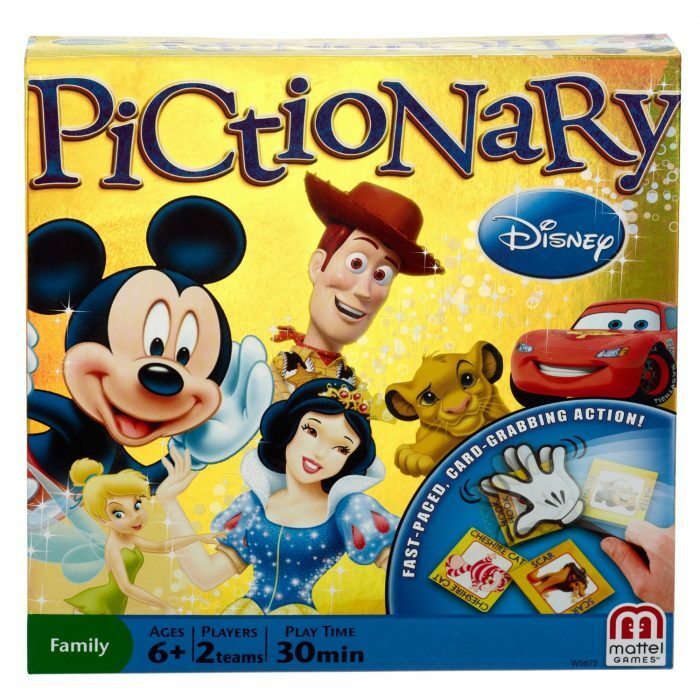 Lots of family fun for everyone with this Disney version of Pictionary! Take your family on a trip to the wonderful world of Disney at home with the Disney Magic Kingdom Game. 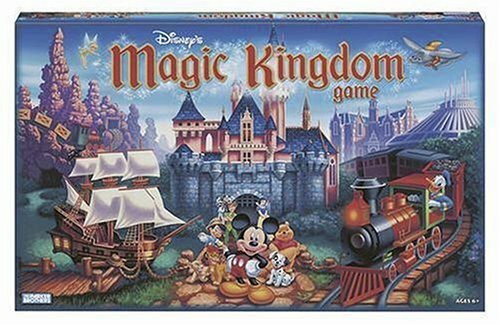 Players travel their way through Pirates of the Caribbean, Frontierland, Space Mountain, Snow White’s castle, the Haunted Mansion, and many other favorite Disney attractions, all on a board game. The first player to visit 5 attractions on their given cards and then make their way back to the park entrance wins. 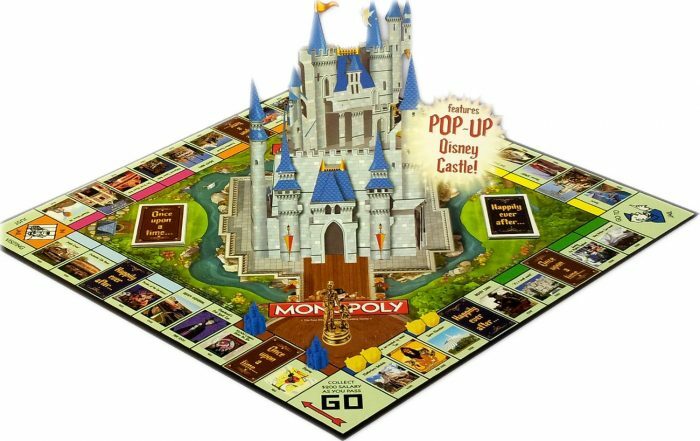 The Magic Kingdom Disney Board Game includes game board, cards, dice, 5 player pieces, and two zinc Mickey Mouse and Donald Duck pawns. Recommended for bigger kids, with lots of grown up fun too! Younger kids can easily play along with help from grownups. The classic game of Sorry! takes on a whole new Disney twist that’s simply magical! 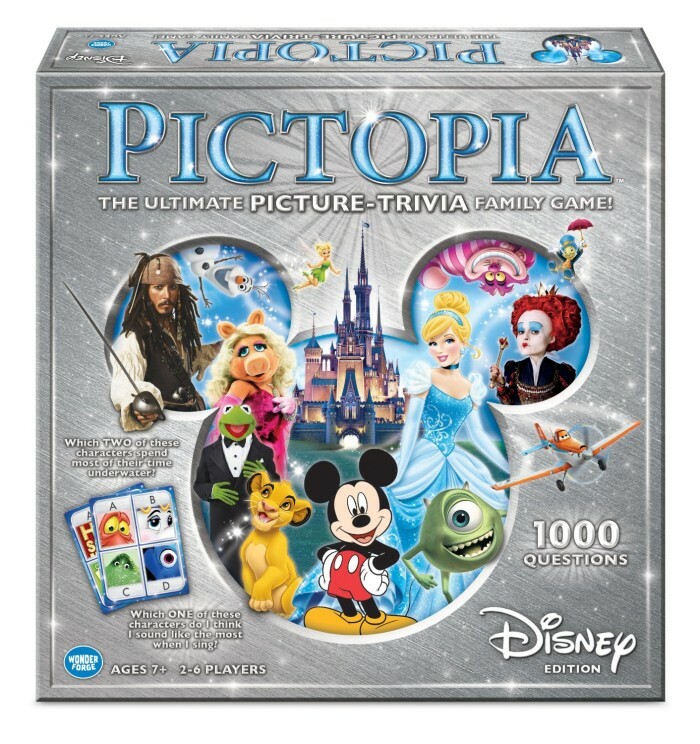 Not only is the game enhanced with your favorite Disney heroes, villains, and friends, but also includes special cards that can give each player or team a chance to advance or be sent into retreat. Tarzan, Captain Hook, Pooh, and Ariel players or teams race to be the first one to make it home. Recommended for kids ages 6 and up. Who doesn’t love a good game of Monopoly? 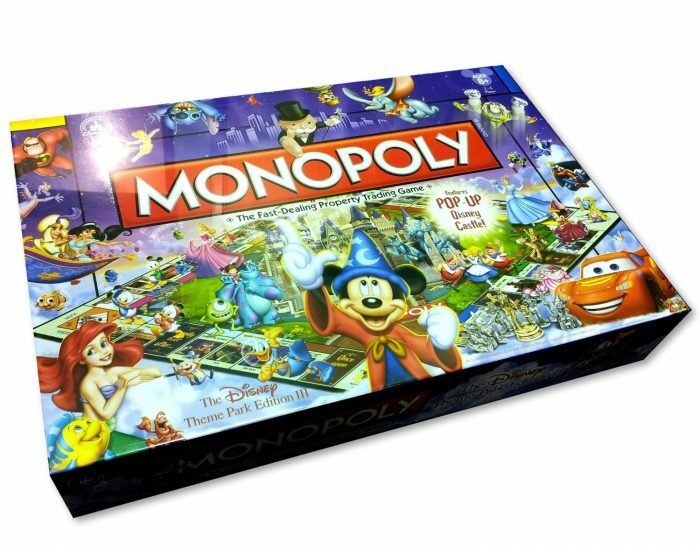 Pair the classic game with Disney and you’ll have many hours of magical fun for the whole family. Players purchase theme park properties with Disney money and build with Toontown houses and Disney castles to win. 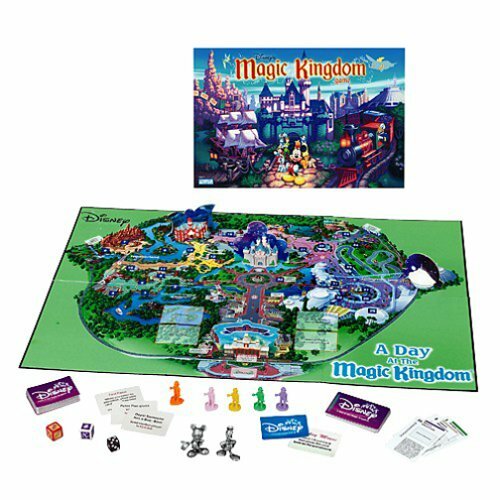 The Disney version includes Disney theme park attractions, Sorcerer’s Hat and Magic Mirror cards, Mickey Toontown houses, Disney castles, Pop-up Disney castle, and 8 collectible Disney character game pieces. Recommended for kids and adults ages 8 and up. Players use special Disney-themed word play to spell their way through the most popular word board game! 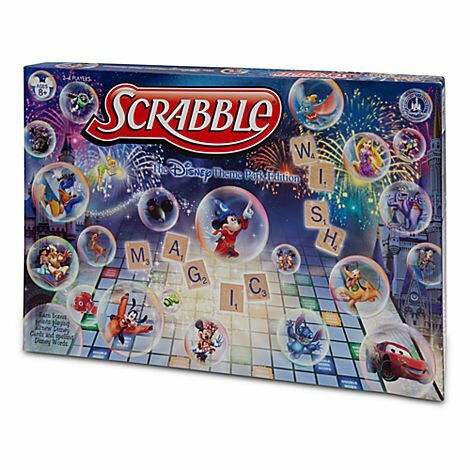 Join Disney with Scrabble and what do you get? A bit Goofy and a lot of Magic for hours of family fun that’ll have your family playing over and over. 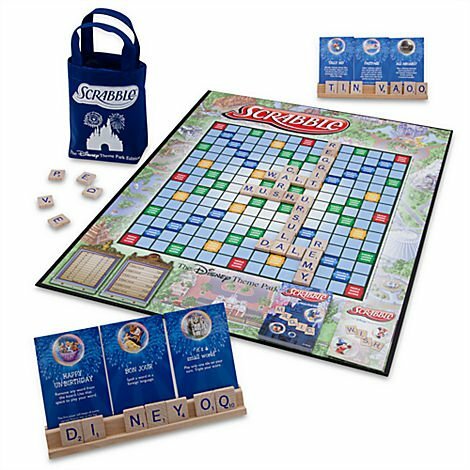 Includes Magic Cards and bonus points for Disney themed words, with Disney tote bag, Disney bonus word cards, and custom tile racks. 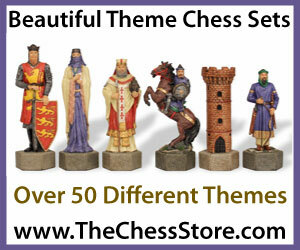 Recommended for kids and adults ages 8 and up, with 2-4 players. Playing board games is a natural way to develop necessary skills when kids can play with friends, siblings, cousins, aunts, uncles, parents and grandparents. Having a challenging selection of games for children as they grow and develop helps them learn more easily while they have fun and gain skills for success. 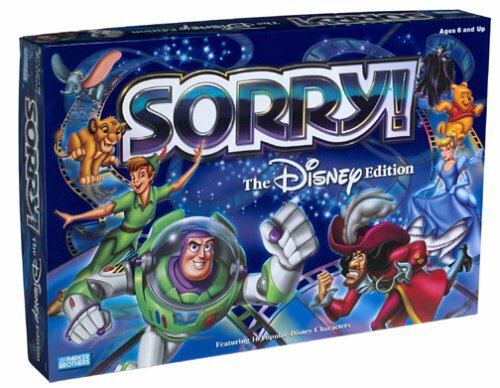 Many of the Disney board games give several classic games a fun twist that provides variations in play and some different challenges.